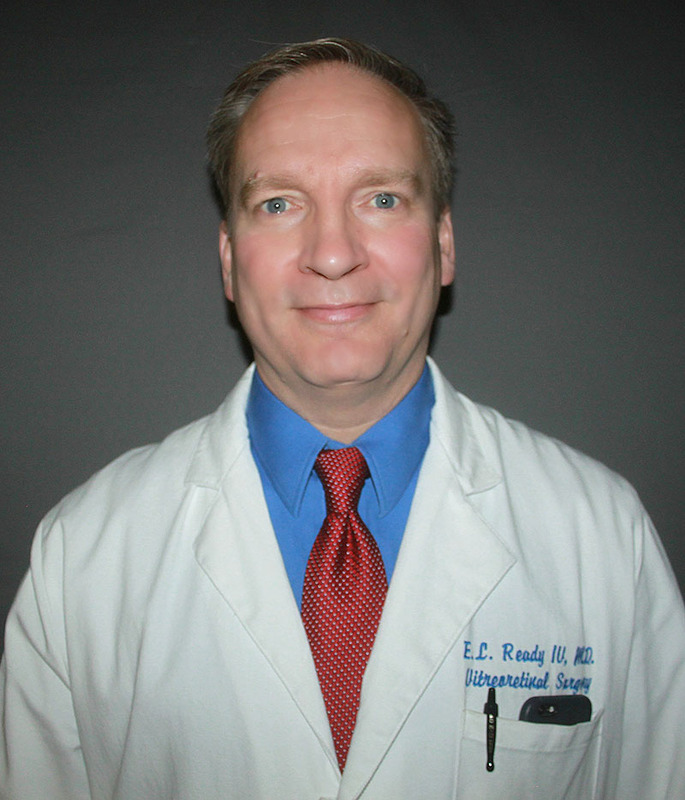 Dr. Ready lives in Huntsville with his wife, son and two dogs. Branch retinal artery occlusion: visual prognosis. Mason JO 3rd, Shah AA, Vail RS, Nixon PA, Ready EL, Kimble JA. Am J Ophthalmol. 2008 Sep;146(3):455-7. Epub 2008 Jul 2. Acute Posterior Multifocal Placoid Pigment Epitheliopathy and Thalamic Infarction. Yunker, Jacob J. MD; Ready, Edgar L. IV MD; Tucker, Charles L. MD; Morris, Robert E. MD; Witherspoon, C Douglas MD. Retinal Cases and Brief Reports: summer 2008 Volume 2 Issue 3 pp 209-212. Highlights of Ophthalmology: Modern Management of Ocular Trauma; Chapter 2 General Evaluation of the Traumatic Eye (2006). Edgar L. Ready IV, MD., Charles L. Tucker, MD., C. Douglas Witherspoon, MD., Robert E. Morris, MD. Acute aminoglycoside retinal toxicity in vivo and in vitro. Hancock HA, Guidry C, Read RW, Ready EL, Kraft TW. Invest Ophthalmol Vis Sci. 2005 Dec;46(12):4804-8. Surgical prevention of posterior capsule opacification. Part 1: Progress in eliminating this complication of cataract surgery. Apple DJ, Peng Q, Visessook N, Werner L, Pandey SK, Escobar-Gomez M, Ram J, Whiteside SB, Schoderbeck R, Ready EL, Guindi A. J Cataract Refract Surg. 2000 Feb;26(2):180-7. Update on fixation of rigid and foldable posterior chamber intraocular lenses. Part II: Choosing the correct haptic fixation and intraocular lens design to help eradicate posterior capsule opacification. Ram J, Apple DJ, Peng Q, Visessook N, Auffarth GU, Schoderbek RJ Jr, Ready EL. Ophthalmology. 1999 May;106(5):883-90. Apple DJ, Auffarth GU et al. Foldable Lenses: Evolution, Clinicopathologic Correlation, Complications. 350pp, Hard Cover, 2000 ISBN 1-55642-435-3. Apple DJ, Ram J, et al. A global perspective entering the new millennium. Celebrating: The 50th Year of Harold Ridley’s invention of the inraocular lens. Survey of Ophthalmology 2000; supplement 3.